Poppy Browne never stole anything in her life before moving to Pleasant Acres and meeting Mary Jane and Whitney. But when Poppy walks out of the mall with her two new friends and her first pair of stolen jeans, she's hooked. Before long, Poppy is lifting whenever she gets the urge--it's never about the merchandise, it's always about the thrill. But when her secret gets out, Poppy's clique turns on each other. As she watches her life collapse around her, Poppy must decide where her loyalties lie...and how far she'll go to protect herself. Especially well drawn is Poppy’s crush, a quirky, sincere minister’s son, who—as Poppy’s world spins out of control—comforts her with unconditional support: “We all make mistakes. It says so in the Bible, so it’s gotta be true.” Will appeal to all teens interested in wayward behavior. 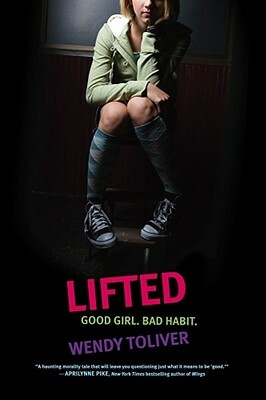 “Lifted is the story of an imperfect heroine seeking her place not only in school, but in life. Its exploration of the amount of truth behind social and religious stereotypes escalates into a double-dog dare to believe them. A haunting morality tale that will leave you questioning just what it means to be "good."